You know how to keep your face and hands well-protected when you're welding, but what about the rest of you? Cover yourself in this Black Stallion Men's JF1332 OR Hi-Vis Orange TruGuard 200 Flame-Resistant Cotton Hooded Sweatshirt. It's way more comfortable than ot ... (see full details) (see specifications) #JF1332-OR. You know how to keep your face and hands well-protected when you're welding, but what about the rest of you? Cover yourself in this Black Stallion Men's JF1332 OR Hi-Vis Orange TruGuard 200 Flame-Resistant Cotton Hooded Sweatshirt. It's way more comfortable than other protective equipment, and it's going to keep you safer while you work. This premium sweatshirt is manufactured with flame-resistant cotton knit material. Natural cotton fibers are soft to the touch and breathable, so you'll stay comfortable all day. Flame-resistant cotton takes things to a whole new level of safety, too. It resists burning, scorching, melting - all of that stuff that you don't want ruining your otherwise great day. 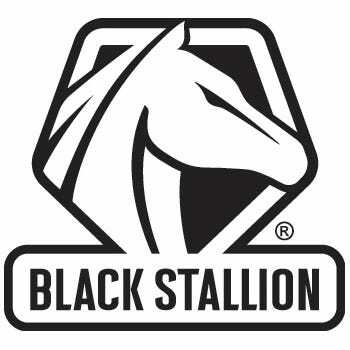 The removable hood attaches to the Black Stallion sweatshirt with sturdy snaps. A welder's collar keeps your neck protected as well. The full zippered front is covered with a protective flap to guard you against sparks. The front pockets have overlap closures to keep the stuff inside secure, too. There's even a scribe pocket for your soapstone holder, which is just another added convenience for all of you welders out there. A flame-resistant label on the sleeve of the men's sweatshirt shows inspectors that you know what you’re doing. The hi-vis orange color keeps you highly visible even in low light conditions. Wide, 2-inch strips of reflective taping surround you in the middle and cross up over your shoulders to become a bold “X” in the back. This way, even when your back is turned, others behind you can still see you. Bright yellow borders outline the reflective taping, so it's a material that's designed to light up and reflect light even in dim conditions. When you're welding, it's not just certain parts of your body that need to be protected. All of your needs to be protected. Put on this Black Stallion Men's JF1332 OR Hi-Vis TruGuard 200 Flame-Resistant Cotton Hooded Orange Sweatshirt from Working Person's Store, and you'll keep the other important parts of you safe, too. Fit great right out of the package, very visible so my fellow employees can see me walking on the railroad tracks while we move rail cars around, I received the 3xx to go over another sweatshirt it's not tight at all great movement and warmth detachable hood is very convenient large enough to go over my hard hat. Working for the state department of transportation, I need something that meet the standards. They are very strict on what we wear. I'm always on the side of the interstate doing construction and maintenance. This Black Stallion hooded sweatshirt is on the approved list and I wear it all the time. It is perfect and won't fade after washing and drying, which is very helpful to extend its life. At first I thought that these hoodies were a bit expensive. So I went with a cheaper brand and regretted it. I ended up buying this Black Stallion FR hoodies a couple months later and completely understand the price now. It is so bright and doesn't fade after washing. I figured my life is worth the cost and then some. Black Stallion FR Sweatshirts: JF1332 OR Hi Vis Orange TruGuard Sweatshirt is being added to your cart.